Diet members gathered in front of the gate of U.S. Marine Camp Schwab to voice their opposition to the construction of a new base, at around 8 a.m. on April 4. 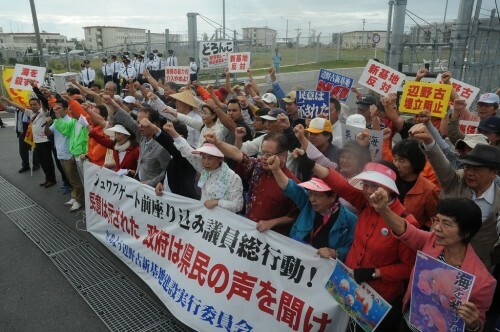 A protest by 84 people, including members of Japan’s national parliament, took place in front of the gate at U.S. Marine Camp Schwab on April 4. The protesters called for a halt to the construction of a new base. The demonstration was organized by the Committee to Stop New U.S. military Base Construction in Henoko, which consists of assembly members and citizens groups opposing the relocation of U.S. Marine Corps Air Station Futenma to the Henoko district of Nago. The protesters gathered at the gate at around 7 a.m., and shortly after began voicing their opposition to the construction. As well as two Okinawa Prefectural Assembly members and three Ishigaki City Assembly members, three of Okinawa’s Diet representatives also took part. They were Seiken Akamine (the Communist Party), Denny Tamaki (Seikatsu no To : People’s Life Party ), and Keiko Itokazu (independent). Two more protests are planned at the same location for April 7 and 8. The politicians also plan to take part in a rally at Okinawa’s Cellular Stadium, Naha, on May 17, which is expected to attract around 10,000 people. Workers employed by the Okinawa Defense Bureau did not carry out work from marine construction barges or from a crane barge on the morning of April 6. On the same date, 10 canoes carrying protesters were surrounded by the Japan Coast Guard in eleven inflatable boats.